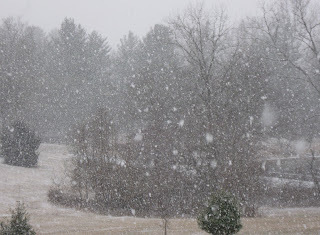 We are having another snow day, here in Northern Fauquier county. After 28 years with the US Postal Service and their motto of "Neither Rain nor Sleet nor gloom of night will stay these couriers....blah, blah, blah.....I stay home when it snows. In 28 years, I managed to slide off the roads into ditches only 3 times. But that was 3 times too many for me. 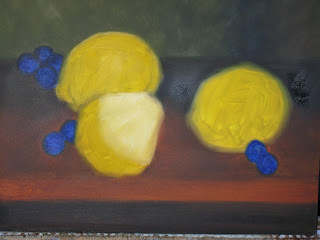 So today instead of working on my submission to the Portrait Society Competition this year, I will work on this little painting of lemons and grapes that I started this week. I started it here at the house studio. But I have had another death in my family, my mother in law Jean Nosner, and so I did not get much work done this week. I hope to also start another miniature on Ivorine this afternoon. What you see here is a general blocked in idea. I was only trying to get the composition worked out with some general colors. Very rough at this point. Please don't judge me on this, yet. I think that I may be finished with these two miniatures. What do you think? I worked on deepening the color of the flowers and defined the seed heads more. Then I worked on the greenery again. On the left image, I used ultramarine blue to darken the leaves and on the right image I used a combination of ultramarine blue and indian yellow to make a green similar to sap green. I liked the right image better. I am sure that there must be more to do to these, but I honestly worry that I might get heavy handed and overwork the little paintings. My favorite part of them is the way the goldfinches are very translucent and have good form. Here it is finally, another step in the goldfinch paintings. I have been dealing with some bad health problems and a recent death in our family. Maybe I can get back on schedule this week. These two little paintings measure 2 1/2 inches tall by 3 inches wide. They are progressive layers of very thin oil paint. I have resolved the earlier problem with the sanding film....no more scratches are visible, and I have darkened the value of the backgroud. I think that looks much better. I have just finished putting in more details on the little birds and I worked on the greenery. I could not resist the little dot of reflected light in the eyes of the finches. Now I feel like I have made some progress. Unfortunately, under the magnifing glass, I can see all sorts of bits and pieces of lint and dust getting into the painting and it is driving me mad. I will research this problem further. It is the same thing that drove me away from painting on porcelain years ago. I could not abide seeing all the miniascule dust and lint in my works. NO one else is going to see this, but it makes me crazy. I made a decision to darken the background of the little paintings because I liked the contrast of values that I saw in the photographs. I think it is an improvement, but only time and a finished painting will tell the tale. What do you think? This was not easy either. Next time, I will get that dark background in first.